Scientists don’t work in a vacuum. Their work should always come along with a rigorous review process to ensure their methods and results aren’t wild, misinterpreted, or outright made up. But what if you’ve found a way to fake your own review? In this case, Springer, the publisher of Tumor Biology through 2016, told us that an investigation produced “clear evidence” the reviews were submitted under the names of real researchers with faked emails. Some of the authors may have used a third-party editing service, which may have supplied the reviews. The journal isn’t a top tier one, but still has some readers—it’s ranked 104th out of 213 tumor-related journals. In fact, it previously retracted 25 journals last year, and Springer has since ended their contract with Tumor Biology. The journal’s new publisher, SAGE, knew about the retractions during the takeover, according to Retraction Watch. 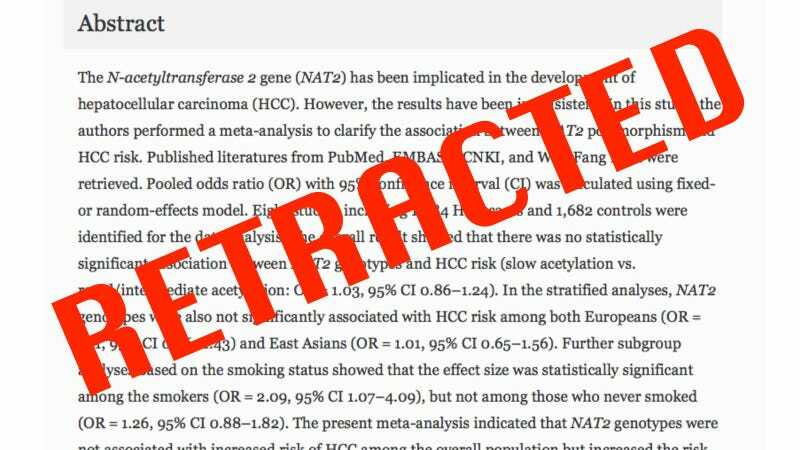 These mass-retractions seem to be a repeating pattern, though—we previously reported on 120 journals retracted from Nature and IEEE journals in 2014, too. By now your might be familiar with the fact that the peer review system has many issues. Some predatory journals take papers without it (plus a fee), and if you don’t like your peer reviewer’s comments, you can always just publish your paper somewhere else without changing anything. SAGE does want to fix the problem, and plans to overhaul the journal as well as the peer review process across their publications. But oh man. 107 papers is so damn many. You can check out the list here.